The new moniker totally makes sense. As Super Bowl fever sweeps over the country, big food brands are also getting into the fun. 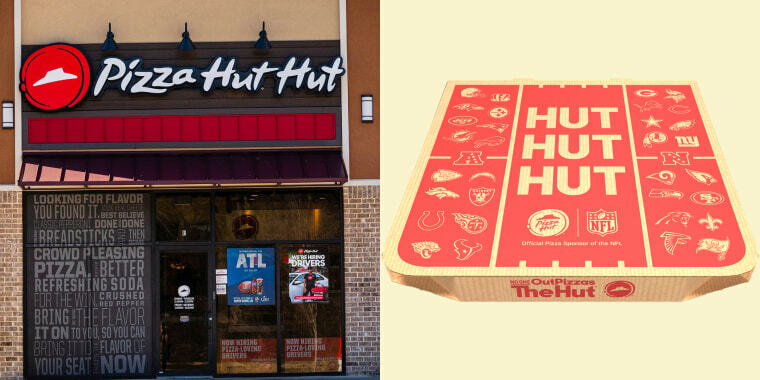 Pizza Hut, which is the now game's official pizza sponsor, has announced that it will be (temporarily) changing its name to honor football's biggest annual event. World, meet Pizza Hut Hut. A restaurant changing its name? We've certainly seen that before. Last year, pandemonium ensued when IHOP briefly became IHOB to promote its new burger offerings. Of course, that change was permanent either and Pizza Hut (Hut!) is actually following suit and changing its name online as well as one physical store in Atlanta, where the Super Bowl is being played at the Mercedes-Benz Stadium. Sure, it's cute to pay tribute to a popular football term by adding an extra "hut" to the name, but is there anything else going into the promotion other than a temporarily longer name? Yes, actually. Pizza Hut anticipates selling more than 1.5 million pizzas during Super Bowl LIII, and is currently offering a special that includes a two-topping pie for $7.99. Members of Hut Rewards, Pizza Hut's rewards program, who order pies online Super Bowl Sunday will also receive a unique code to receive 20 percent off any NFL merchandise on NFLShop.com. As expected, social media reactions to the name change have been pretty mixed. Some people are cheering on the brand for clever football tie-in, while others are already over it. Only time will tell if the brand's cheesy experiment pays off with a record number of delivery orders.